If a fire does damage your home, learn the steps to take. It’s important to call the members of your family who were not with you to let them know what has happened and to reassure them that you are all right. 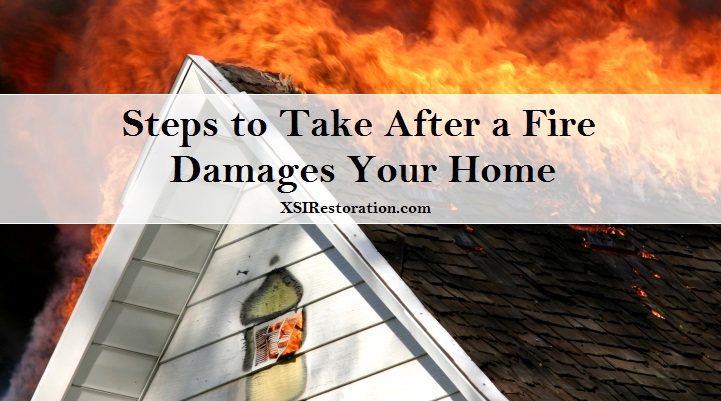 It’s also vital to contact your insurance company to report the fire and start the claim process. The customer service representative will be able to tell you how to arrange for emergency shelter and living expenses. Be sure to keep copies of all your receipts. Emergency services can provide tips on the best way to do this. Your insurance policy will probably require that you take this step. Keep in mind that smoke and soot leaves a residue on wood, fabric and even concrete, since these materials are porous. The longer they are left on site after the fire, the worse the odors will become. We can remove your furniture and contents to our secure cleaning facility for inspection, cleaning, restoration and refinishing as required. For items which cannot be removed, we use ozone to neutralize the offensive odors left after a fire. We here at XSI Disaster Services have the experience to deal with your personal documents, electronics and even your precious collectibles. Give us a call today at (770) 787-9096 to learn more about how we can help to restore a sense of normalcy and peace after a personal disaster. We Are Here For You – Call Now!